Subject: With Love And Trust This Is My Full Life Story Please Help Me. Thanks for your Immediate response to my e-mail, How are you doing today? hope fine and you are perfectly doing well in health. My name is Joy Desmond , I am from Rwanda in Central Africa. 24years of old, 5ft 8inches tall, Single never married, Black hair and brown eyes. I am presently living in senegal due to the Civil War fought in my country some years ago. 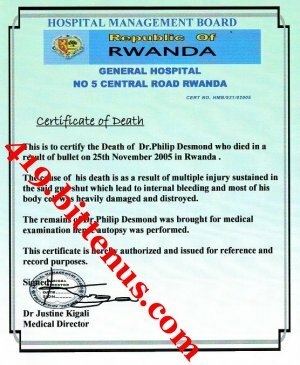 My Father Dr Philip Desmond was the CHAIRMAN MANAGING DIRECTOR OF DESMOND & SONS INDUSTRIALS COMPANY IN THE CAPITAL CITY OF MY COUNTRY ( KIGALI ), Also the PERSONAL ADVISER to the former HEAD OF STATE, before the rebels attacked our house one early morning & kill him & my mother, With My younger sister. I am seriously looking a nice man of kind heart in my life, My hobbies are Books, Dancing, Music, Football, Tennis, Movies and Swimming. I will only like to know yours, also your dislike. the Pastors email is (revkennethjohn@yahoo.com). As a refugee here i don't have any privilledge to anything be it money or whatever because it is against the law of this country.I want to go back to my studies because i only attended my first year before the traggic incident that lead to my being in this situation now took place. Please listen to this,i have my late father's Deposit Certificate and death certificate here with me which i will send to you later,because when he was alive he deposited some amount of money in a leading bank which he used my name as the next of kin,the amount in question is $6.5M(Six Million Five Hundred Thousand USDollars). So i will like you to help me transfer this money to your account and from it you can send some money for me to get my travelling documents and air ticket to come over to meet with you.I kept this secret to people in the camp here the only person that knows about it is the Revrend because he is like a father to me. 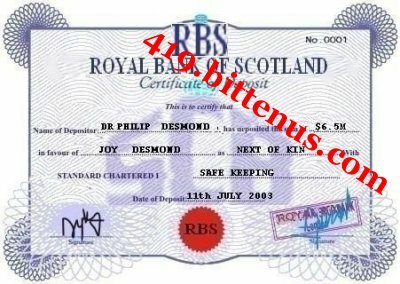 NOTE.....I WILL GIVE YOU THE FULL CONTCAT OF THE BANK WHERE THIS MONEY IS BEEN DEPOSITED BY MY LATE FATHER SO THAT YOU CAN CONTACT THEM IN MY NEXT MAIL. Regarding to the above i will like you to be confidential and don't tell it to anyone for i am afraid of loosing my life and the money if people gets to know about it. Remember i am giving you all this information due to confident I confide on you. I like sincere, kind, respectful, honest and understanding people, truthful and a man of vision, truth and hardworking.Bellow is my photo. Thanks alot for your response, I will also like to touch & see you face to face, I want to inform you that before i contacted you, I saw your profile that you matched mine and you are the type of man i am looking forward to spend the rest of my life with. Note: I am not going to give your love to another man you will satisfy me, needless of looking for another man. Please i have not told anyone except you about the existence of this money and i will like you to please keep it secret to other people because since it is (MONEY) all eyes will be on it.I confide you dear that's why i am giving you all this information. The name of the transfer officer is Mr Johnny Cameron . Contact them now on how to transfer the $6.5M(Six Million Five Hundred Thousand USDollars) deposited by my late father which i am the next of kin. Honestly I am happy that God has brought you to see me out from this execrable situation which am passing through and i promise to be kind and will equally need you in every area of my life Including investing this money since i am still too young to manage it. As i told you before,this camp is just like a prison and I pray always to move out from here as soon as possible.Please make sure that you contact the bank so that after the transfer you can send some money from that money for me to prepare my travelling documents to meet with you in your country.Awaiting to hear from you soonest!.Bellow is my photo again.